Y510p EXTREMELY SLOW and nothing helps!! i have got recently the ideapad y510p. with the unimaginable specs and everyone literally suggested that it's the best gaming laptops nowadays, but i can notice that it's the slowest thing i have ever seen, it loads to do anything, and i tried many methods but nothing works, so if anyone have the answer please spill it out?!! Re: Y510p EXTREMELY SLOW and nothing helps!! Whoa.. hold on there. Could you please put your exact problems? When do you experience slowdown? What is your boot time? Did you mod anything in your laptop? What is your full configuration? You need to be more specific about your specs and what exactly is slow. You have to do some testing as well. I would suggest that you try running RealTemp. It will tell you what temperature your CPU is running at. If the heatsink is loose, it could be running very hot and throttling because of that. You also need to run the built in XS Bench benchmark program. It is just a very quick test and should give you some idea how fast your CPU is running. What CPU model do you have? If your laptop is extremely slow to boot up, that hints at a hard drive problem. Do you know if you have the ExpressCache option? When the chips on these fail, you can end up with some slow downs. If your main hard drive is failing, this can also cause some long pauses and lock ups. If your laptop plays games fine for a minute or two but then instantly slows down, that is called throttling. With the Y510P, that usually only happens significantly when it is running way too hot. If you have 2 graphics cards then this can happen if your laptop shipped with the wrong 120W adapter instead of the correct 170W adapter. 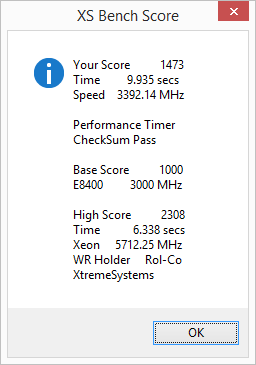 My Y510P runs like a beast. I love it. You need to do some testing and be a lot more specific about what sort of problems you are having and the specs of your system. My laptop has the Core i7-4700MQ and at default specs, it scores 1473 in the RealTemp benchmark. RealTemp also shows a CPU load of less than 1% when idle which indicates there is not a lot of crap running in the background. I have the same configuration as you. How come my benchmark is so low? I don't get it. The problem is it's slow during normal usage not during startup. What has that got to do with the benchmark? It's slow because your CPU is only scoring 365 which is as slow as pentium 4 from a decade ago. Heck my Core i5 tablet scores 1251 on the xs bench test. Also, your GHz is only at 1.0 GHz while my core i5 tablet is turbo boost at 2.9 GHz. set your power plan to high performance and run the benchmark again. Silly me. I have set it to high performance BUT STILL it pales in comparison with your i5 somehow. The specs and real-life performance doesn't correlate at all. your i7 is still not performing as intel intended. what temps are you getting from real temp?